The Seder meal associated with Passover is a great way to find some Passover recipes to get your child into cooking. You can use it as a way of getting your child interested in preparing food for large groups of people or as a way to get them talking about why Passover is celebrated, depending on the age of your child. You can talk about the importance of separating the eggs instead of using yeast to make the bread and how the Jews left Egypt so fast that they had no time to let the bread rise. When you’re chopping up the horseradish, you can discuss the Torah’s passage about the bitterness of slavery. However, you can just make some traditional recipes for fun as a way of spending time with your child. 8 medium apples peeled and quartered. Red apples tend to work better as they are naturally sweeter than their green counterparts. 3 tablespoons of sugar. You may need more if your apples are tart, or if your guests have a sweet tooth. 4 tablespoons sweet red wine. Chop all the dry ingredients together until the largest pieces are the size of half a peanut. Add the red wine to taste. The overall mixture should be fairly thick, and these measurements will give you around 3 cups worth. If you’re trying to introduce your child to the religious aspect of Passover, you’ll need to include some unleavened bread at some point. 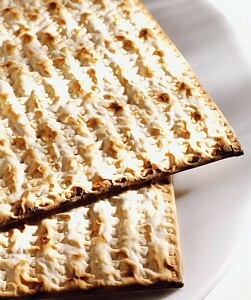 Break the matzos up into quarter size pieces and soak them in warm water for a few minutes. Drain the water out and use some paper towels to squeeze the mush as dry as possible. Beat the eggs with a fork and then mix in with the rest of the ingredients. Get the oil nice and hot in a skillet and fry 2 tablespoons of the mixture at a time. You can eat them as they come off the skillet or serve with honey for dipping. Beat the eggs well in a bowl. In a separate bowl mix the salt, pepper and matzo. Dip each strip into the egg mixture, then into the matzo, making sure that the matzo mixture sticks all the way round each strip. Then fry at a high temperature for 2 minutes on each side, or until the chicken is fully cooked through. Try to get your child to help you make these easy Passover recipes as both an introduction to the tradition of Passover and to create an interest in cooking. Do you have an Easy Passover Recipe or Cooking Activity? Do you have a seasonal activity or recipe to share?